The 141 foot motor yacht WAKU represents one of the major challenges in yacht design – creating a look that is distinctive, but not outlandish. 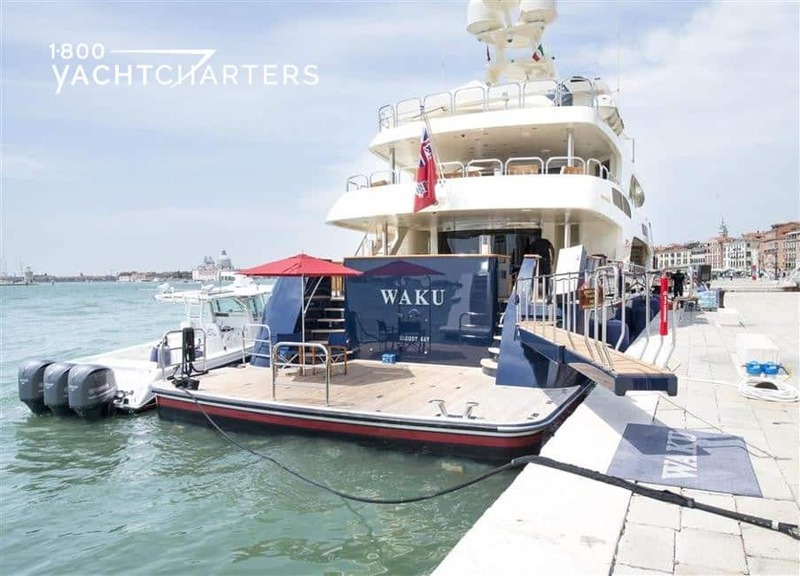 Trinity yacht WAKU, a trideck superyacht seems to have hit just the right balance. 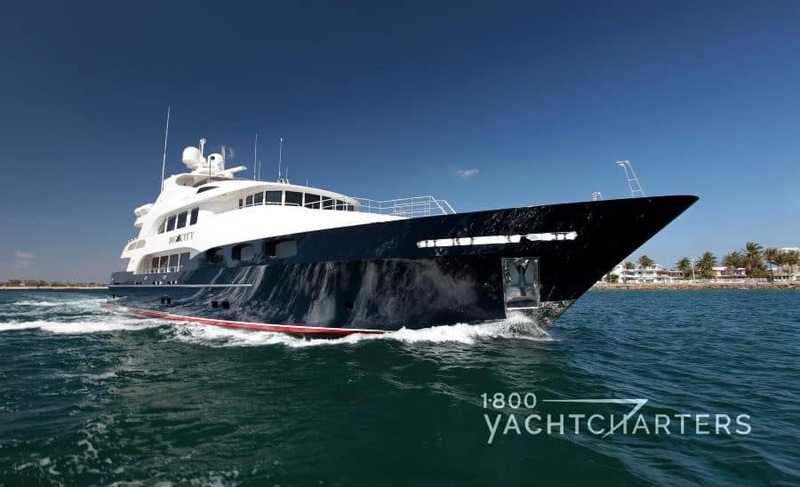 Her deckhouse side windows are a series of rectangles that enhance the visual mass of her full-beam superstructure, while her prominent bow and raised bulwarks give her forebody the look of a much larger megayacht. WAKU is a semicircle of glass panels, offering panoramic vistas from the full-beam, split-level master suite. The raised forward portion has a sleeping area with a king bed, literally a throne from which the mega yacht charter client can survey his surroundings. Adjoining areas on the lower level include his and her heads, a dressing/sitting area, and an office. For thrillseekers, there’s a 32-foot Intrepid Small Town model tender – ideal for fishing or high speed watersports. 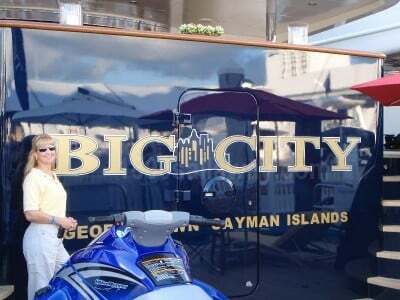 This big tender is perfect for exploring the shallow waters and blue grottos during a Bahama yacht charter. This spectacular mega yacht was built by Trinity Yachts, one of the United States’ most honored builders of custom super yachts. This superyacht is the newest 5 stateroom design from Trinity Yachts to be offered for international luxury charter. 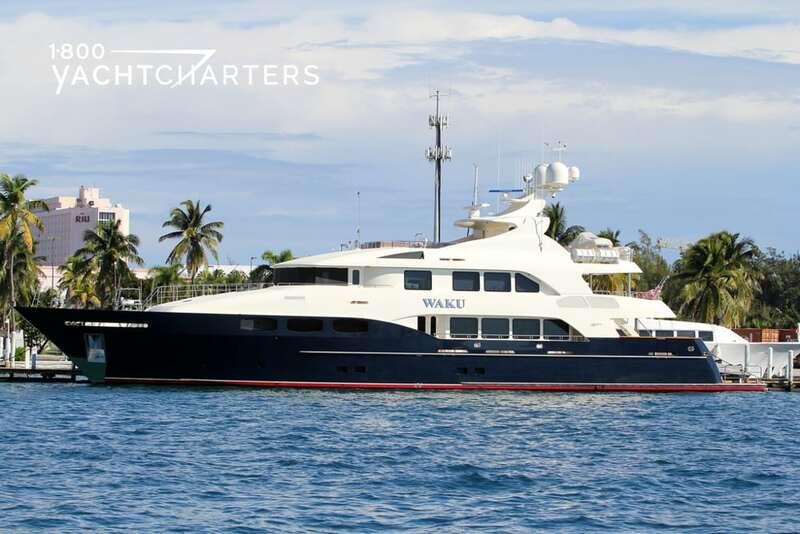 The superyacht features sophisticated décor by renowned interior designer, Dee Robinson, and the design is complimented by her distinctive dark blue hull. The yacht is equipped with the latest technology including “at anchor” stabilizers. 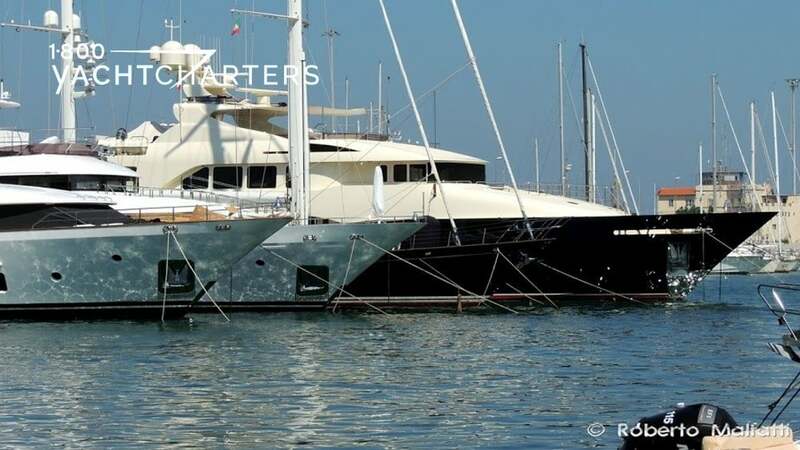 After her launch in 2009, the vessel crossed the Atlantic Ocean and offered summer Mediterranean yacht charter to Americans as well as European clients seeking a Trinity yacht charter vacation. Five luxurious staterooms can accommodate 10 guests on board. The main salon and dining room presents a light and airy atmosphere. Forward is the formal dining table with seating for ten passengers. Aft is a spacious living area with plenty of seating and a full entertainment system powered by a Kaleidescape central movie/music server with universal touch screen remote controls. Remote lighting control by Crestron touch screens are employed throughout the yacht. A walkthrough description of the interior begins with the open-plan main salon and dining area. The dining area is separated by a credenza with a large high definition television. The dining table seats 10 for formal evening service. The main salon (living room) features a wet bar aft with 2 stools. A day head (powder room) is located in the forward section of the salon. There is a glass wall aft with sliding doors to the aft deck. On the aft deck, two tables join to seat 8 to 10 guests. There is a wet bar, a TV, and a circular stairway to the upper aft deck and sun deck. A dual stairway on the aft deck leads down to an oversized swim platform referred to as, “the beach,” with 2 umbrellas and sun chairs. The upper aft deck has a large circular dining table that seats 10 to 12. Forward is the skylounge with ample seating, a large-screen high definition TV, large semi-circular wet bar with 4 stools and a Powder room. The Sundeck features an L-shaped wet bar with 6 stools, a TV, casual dining banquette to port side with seating for 6 and a Powder room. 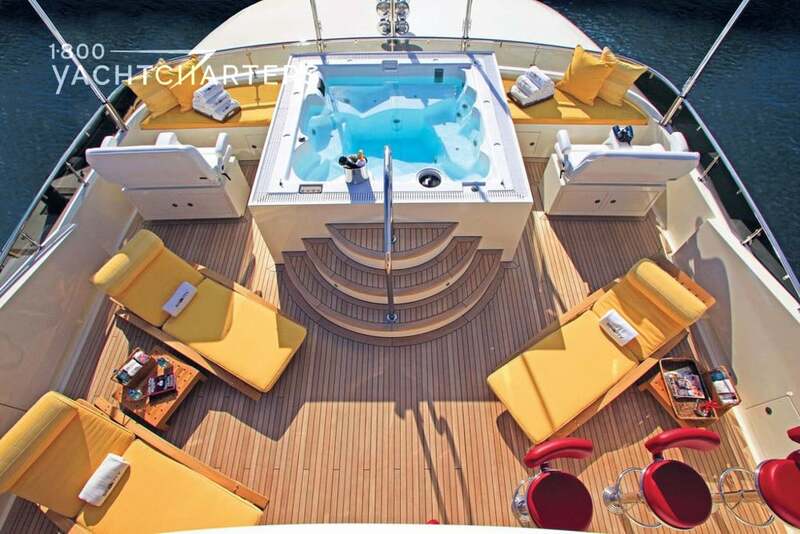 A Jacuzzi hot tub is forward, along with casual seating both port and starboard. 1-800 Yacht Charters represents multiple Trinity Yachts for charter; including Mustang Sally, Amarula Sun, Anjilis, Mustique, and Janie.